Published: Feb. 25, 2013 at 05:35 p.m. Updated: Feb. 26, 2013 at 08:32 a.m.
Geno Smith was widely considered the top quarterback prospect in the 2013 NFL Draft prior to the NFL Scouting Combine. And Smith only strengthened his position with a solid performance. So one lucky franchise is going to get its quarterback of the future. And if you are a fan of one of those quarterback-starved teams and skeptical on if you should want Smith to go to your team, allow me to offer up six reasons why you should want to root for him. Steve Mariucci's first question to Smith was "do you have a nickname?" And Smith said yes, "it's Geno. That's it." And you know what, it's nice to have a player entering the draft without a prepackaged nickname and marketing campaign. He's just a guy who wants to play football. You can tell a lot about a person just based on the people they follow on Twitter. So when a quick review of Smith's list revealed Kobe Bryant, a small part of me rejoiced. Of course, he also follows LeBron James, so I had to move this down the list a little bit. 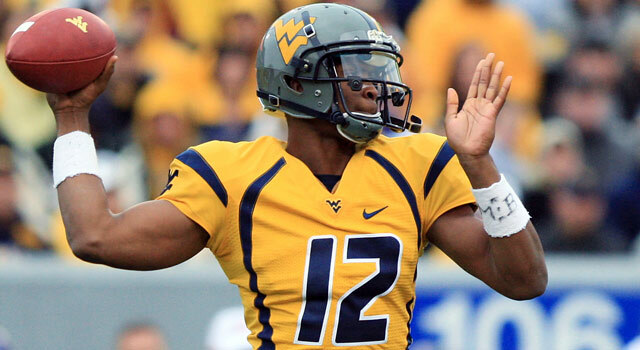 One of the most amazing things about Smith's senior season at West Virginia was his lack of interceptions. Smith opened the season with 24 touchdowns and no interceptions in the first six games. And even then, he threw just six over the course of the 2012 season. Arizona Cardinals quarterbacks tossed 21 picks last year. Smith was labeled as gifted as a young child and "was taught an advanced curriculum emphasizing creativity and the arts," according to this article in the New York Times. Smith wrote poetry, painted, acted and even participated in chess tournaments. The latter is a handy skill to have when trying to match wits with defensive coordinators. Maybe this is a touch superficial, but there's something aesthetically pleasing about a quarterback in the No. 12. To current guys like Tom Brady and Aaron Rodgers, to historically great QBs like Randall Cunningham, Roger Staubach, Terry Bradshaw, Kenny Stabler and Joe Namath, the No. 12 is the quarterback number to wear. We got a glimpse of it when he joined us on NFL.com Live Super Bowl XLVII and got another inside look here. Smith won't back down from being a No. 1 quarterback. He's ready to embrace a spot as the leader of a team. And given the dire needs of some teams, this is something to be celebrated. "Most spectacular USC QBs in NFL history..."